The Eva Solo knife stand accommodates many sizes of knives and utensils. 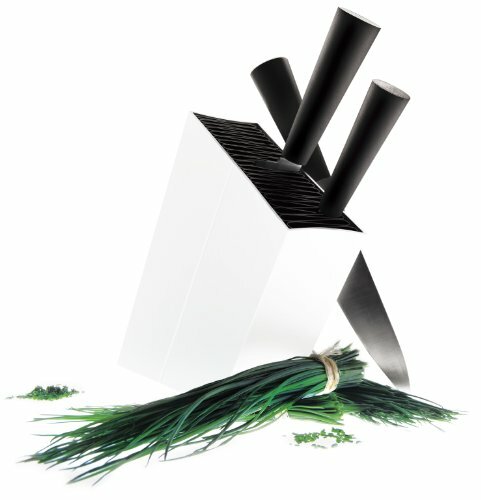 The knife stand is an aluminum box with a flexible folded accordion style plastic insert for holding knives and kitchen utensils. The removable insert can easily be removed and cleaned in the dishwasher. The knife stand with the plastic insert can hold up to a combination of 40 knives, carving forks and other utensils. Use a damp cloth to clean the knife stand base. Winner of an if product design award. Designer: TOOLS. If you have any questions about this product by Eva Solo, contact us by completing and submitting the form below. If you are looking for a specif part number, please include it with your message.